حسینی, علی, پوراحمد, احمد, زیاری, کرامت الله. (1397). تحلیل ساختار فضایی شهری با تأکید بر بُعد جمعیتی رویکرد ریخت ­شناسی شهر چندهسته ­ای. مطالعه مورد: شهر تهران. مجله آمایش جغرافیایی فضا, 8(30), 19-38. علی حسینی; احمد پوراحمد; کرامت الله زیاری. "تحلیل ساختار فضایی شهری با تأکید بر بُعد جمعیتی رویکرد ریخت ­شناسی شهر چندهسته ­ای. مطالعه مورد: شهر تهران". مجله آمایش جغرافیایی فضا, 8, 30, 1397, 19-38. حسینی, علی, پوراحمد, احمد, زیاری, کرامت الله. (1397). 'تحلیل ساختار فضایی شهری با تأکید بر بُعد جمعیتی رویکرد ریخت ­شناسی شهر چندهسته ­ای. مطالعه مورد: شهر تهران', مجله آمایش جغرافیایی فضا, 8(30), pp. 19-38. حسینی, علی, پوراحمد, احمد, زیاری, کرامت الله. تحلیل ساختار فضایی شهری با تأکید بر بُعد جمعیتی رویکرد ریخت ­شناسی شهر چندهسته ­ای. مطالعه مورد: شهر تهران. مجله آمایش جغرافیایی فضا, 1397; 8(30): 19-38. در قرن بیستم، گرایش­های اولیه تمرکززدایی و تغییرات در فناوری اطلاعات، حمل‌ونقل و ارتباطات منجر به تغییر ساختاری عمده‌ای در شهرها شد و روند الگوی تک­هسته­ای را که به اشتغال در مرکز تجاری شهر (CBD) تمرکز داشت، متوقف ساخت. هنوز درک روشنی از اینکه آیا شهر چندهسته­ای، پایدار یا به لحاظ اقتصادی رقابت‌پذیر هست یا نه، وجود ندارد. هدف از این پژوهش، تحلیل ساختار فضایی شهری با تأکید بر رویکرد ریخت­شناسی شهر چندهسته­ای بر اساس الگوی فضایی کانون­های جمعیتی شهر تهران است. از مساله واحد ناحیه­ای قابل اصلاح (MAUP) برای تعیین واحد فضایی تحلیل استفاده شد. روش­های مورد استفاده خودهمبستگی و آمار فضایی، مدل چندهسته­ای اسمال و سانگ و روش cut-off بود. نتایج حاصل از ارزش شاخص موران برای سه دوره مقادیر مثبت و نزدیک به یک است می‌توان نتیجه گرفت که توزیع فضایی جمعیت تهران دارای خودهمبستگی فضایی است و توزیع خوشه­ای دارد. نتایج تجربی تحلیل cut-off، شیب­های تراکمی و آمار فضایی نشان داد شهر تهران از الگوی تک­هسته­ای فاصله گرفته و در حال تبدیل شدن به یک ساختار چندهسته‌ای است. Early decentralisation trends, changes in information technology, transport and communication led to more profound structural change as the 20th century continued. Therefore, process of monocentric city model stopped, which it focused on employment in CBD. The monocentric city model represents the base that the polycentric city model was built on. There is still no clear understanding of whether or not polycentric city is either sustainable or economically competitive. On the other hand, the concept of functional polycentric city is less well understood than that of morphological polycentric city. The purpose of this study is analysis of urban spatial structure based on the spatial distribution of population on Tehran. The approach examined is of the polycentric city morphological. Modifiable areal unit problem (MAUP) used to determine the spatial analysis unit. The autocorrelation, spatial regression methods, spatial statistics, and polycentric models such as Small & Song, and cut-off have used to analyze the pattern of spatial population distribution. The results showed that the value of the local indicators of spatial association (LISA) for the three statistical periods is positive and close to one. It can be concluded that the spatial distribution of population in Tehran has spatial autocorrelation and a cluster distribution. Experimental results obtained from the slope of the density gradient analysis and spatial statistics showed that Tehran has been transformed from a monocentric city into polycentric, but this structure is still incomplete. رهنما، محمدرحیم و غلامرضا عباس­زاده. 1387. اصول، مبانی و مدل­های سنجش فرم کالبدی شهر. مشهد، انتشارات جهاد دانشگاهی. سعیدنیا، احمد. 1382. ساختار فضایی کلان­شهر تهران. مجموعه مقالات کارگاه تخصصی تدوین سیاست­های راهبردی برای توسعه آتی شهر تهران، سازمان ایرانی مجامع بین­المللی. شکویی، حسین. 1391. دیدگاه­های نو در جغرافیای شهری. جلد اول. چاپ پانزدهم. تهران، انتشارات سمت. عابدین­درکوش، سعید. 1389. درآمدی بر اقتصاد شهری. چاپ سوم، مرکز نشر دانشگاهی، تهران. مدنی­پور، علی. 1387. طراحی فضای شهری، نگرشی بر فرآیند اجتماعی – مکانی. ترجمه فرهاد مرتضایی، چاپ سوم، شرکت پردازش و برنامه‌ریزی شهری، تهران. مرکز آمار ایران (1365)، (1375)، (1385) و (1390). سالنامه آماری شهر تهران، تهران. Alonso, W. 1964. Location and land use. Toward a general theory of land rent. Harvard University Press. Anas, A., Arnott, R., and Small, K.A. 1998. Urban spatial structure. Journal of economic literature, 1426-1464. Anselin, L. 1995. Local indicators of spatial association-LISA. Geographical analysis, 27(2): 93-115. Barrett, P. 1983. The automobile and urban transit: The formation of public policy in Chicago, 1900-1930. Temple University Press. Bertaud, A. 2001. Metropolis: A measure of the spatial organization of 7 large cities. http://alain-bertaud.com/images/AB_Metropolis_Spatial_Organization.pdf. Bertaud, A. 2003. 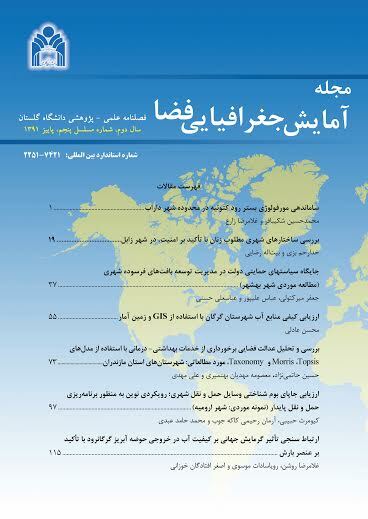 Tehran spatial structure: Constraints and opportunities for future development. Ministry of Housing and Urban Development, Tehran. Boarnet, M.G. 1994. The monocentric model and employment location. Journal of Urban Economics, 36(1): 79-97. Burger, M.J., De Goei, B., van der Laan, L., and Huisman, F.J.M. 2011. Heterogeneous development of metropolitan spatial structure: evidence from commuting patterns in English and Welsh city-regions, 1981–2001. Cities, 28(2): 160-170. Burger, M., and Meijers, E. 2012. Form follows function? Linking morphological and functional polycentricity. Urban Studies, 49(5): 1127-1149. Castells, M. 1989. The informational city: information technology, economic restructuring, and the urban-regional process (p. 15). Oxford: Blackwell. Castells, M. 2011. The rise of the network society: The information age: Economy, society, and culture (Vol. 1). John Wiley & Sons. Champion, A.G. 2001. A changing demographic regime and evolving polycentric urban regions: Consequences for the size, composition and distribution of city populations. Urban Studies, 38(4): 657-677. Davoudi, S. 2003. European briefing: polycentricity in European spatial planning: from an analytical tool to a normative agenda. European Planning Studies, 11(8): 979-999. Dear, M., and Flusty, S. 1998. Postmodern urbanism. Annals of the Association of American geographers, 88(1): 50-72. Ding, C., and Zhao, X. 2014. Land market, land development and urban spatial structure in Beijing. Land Use Policy, 40: 83-90. Fina, M.H. 2000. Urban spatial structure and household travel time. Virginia Polytechnic Institute and State University. Giuliano, G., Redfearn, C., Agarwal, A., Li, C., and Zhuang, D. 2007. Employment concentrations in Los Angeles, 1980–2000. Environment and Planning A, 39(12): 2935-2957. Gordon, P., Richardson, H.W., and Wong, H.L. 1986. The distribution of population and employment in a polycentric city: the case of Los Angeles. Environment and Planning A, 18(2): 161-173. Grava, S. 2003. Urban transportation systems. Choices for communities. McGraw Hill Professional. Green, N. 2007. Functional polycentricity: a formal definition in terms of social network analysis. Urban Studies, 44(11): 2077-2103. Griffith, D.A., and Wong, D.W. 2007. Modeling population density across major US cities: a polycentric spatial regression approach. Journal of Geographical Systems, 9(1): 53-75. Hall, P.G., and Pain, K. (Eds.). 2006. The Polycentric Metropolis: Learning from Mega-City Regions in Europe. Routledge. Hosseini, A., Pourahmad, A., and Pajoohan, M. 2015. Assessment of Institutions in Sustainable Urban-Management Effects on Sustainable Development of Tehran: Learning from a Developing Country. Journal of Urban Planning and Development, 05015009. Kloosterman, R.C., and Musterd, S. 2001. The polycentric urban region: towards a research agenda. Urban Studies, 38(4): 623-633. Kloosterman, R.C., and Lambregts, B. 2001. Clustering of economic activities in polycentric urban regions: the case of the Randstad. Urban Studies, 38(4): 717-732. Lambregts, B. 2009. The polycentric metropolis unpacked: concepts, trends and policy in the Randstad Holland. Amsterdam institute for Metropolitan and International Development Studies. Lee, B. 2006. Urban spatial structure, commuting, and growth in US metropolitan areas. University of Southern California. Leslie, T.F., and HUallacháin, B.Ó. 2006. Polycentric phoenix. Economic Geography, 82(2): 167-192. Meijers, E. 2005. Polycentric urban regions and the quest for synergy: is a network of cities more than the sum of the parts? Urban studies, 42(4): 765-781. Meijers, E. 2008. Measuring polycentricity and its promises. European Planning Studies, 16(9): 1313-1323. Meijers, E.J. 2007. Synergy in polycentric urban regions: complementarity, organising capacity and critical mass (Vol. 13). IOS Press. Meijers, E.J., and Burger, M.J. 2009. Spatial structure and productivity in US metropolitan areas. Pacione, M. 2005. Urban geography: a global perspective. Second edition, Psychology Press, Routledge. Parr, J. 2004. The polycentric urban region: a closer inspection. Regional studies, 38(3): 231-240. Pessoa, R.P.P. 2009. Towards A Definition of Urban Polycentrism for Brazilian Metropolises. In Proceedings of the 4th International Conference of the International Forum on Urbanism (IFoU), the New Urban Question–Urbanism beyond Neo-Liberalism, 1003-1014. Rodrigue, J.P., Comtois, C., and Slack, B. 2013. The geography of transport systems. Third edition, Routledge. Sasaki, K. 1990. The establishment of a subcenter and urban spatial structure. Environment and Planning A, 22(3): 369-383. Small, K.A., and Song, S. 1994. Population and employment densities: structure and change. Journal of Urban Economics, 36(3): 292-313. Taylor, P.J., Evans, D.M., Hoyler, M., Derudder, B., and Pain, K. 2009. The uk space economy as practised by advanced producer service firms: identifying two distinctive polycentric city‐regional processes in contemporary Britain. International Journal of Urban and Regional Research, 33(3): 700-718. Yang, J., French, S., Holt, J., and Zhang, X. 2012. Measuring the Structure of US Metropolitan Areas, 1970–2000: Spatial Statistical Metrics and an Application to Commuting Behavior. Journal of the American Planning Association, 78(2): 197-209.